CRAP the most important file on my system! I often need to temporary create a file or folder when I am working on my computer. Often I forget to delete this work when I have finished using it. Last Century I devised a method to eliminate this clutter. It has saved me having to review thousands of useless files. This file or folder is named CRAP, crap.jpg, crap.txt, crap.js, crap.whatever. I allow uppercase or lowercase. I allow longer crap names like crap1 or crap.spreadsheet. From time to time I search my system for files matching crap*. * and delete them as per the rules below. Rule 1: When you see a crap file or folder NEVER OPEN IT. Rule 2: When you see a crap file or folder DELETE IT. I chose crap because it is short and easy to remember. It also doesn’t often crop up naturally in filenames from other sources. You may have another name or acronym that appeals to you. Start using it today and enjoy the extra hours I offer you in 2019 and beyond. Posted on January 1, 2019 January 7, 2019 Categories UncategorizedLeave a comment on CRAP the most important file on my system! Add a new Custom HTML block in your page. Copy this HTML snippet and set the href and img src within double quotes to your requirements. Include a short image description in alt so your page will pass integrity tests. I watched a YouTube about copying App screens this week and I felt I could do myself a favor by knocking up a Windows App to achieve the same thing in a GUI interface. I didn’t realise how much I had forgotten about Delphi RAD Studio. The utility seems to work and is offered here for download. Last week I found a brilliant YouTube from Dabble Lab that explains how to use the CLI and how to get some Alexa templates to get started with your own skills development on Amazon. I have been battling with both the CLI and the IAM site for several months now. Today I have “User: arn:aws:iam::123456789123:user/debugUser is not authorized to perform: iam:CreateRole on resource: arn:aws:iam::012345678912:role/ask-lambda-basic-starter” when I try to deploy from CLI. At least can I see what user I am using. This will help a lot! I will now try to find CreateRole on IAM. The “helpful” 2017 AWS IAM setup videos are grossly out of date and I have been COMPLETELY CONFUSED by their tutorials. There are users, groups and roles to do my head in but I can’t find the required “CreateRole” mentioned in the message. There are heaps of others which are difficult to read in the drop-downs because the columns don’t expand. I added a group and a role but didn;t work so deleted. Now I an trying this way which failed because you can’t create the create-role until you have one. Chicken or egg! OK just watched ASK-CLI installation to see if I did that right. No clues there. Just another 2 hours wasted today. Wow I just installed Let’s Encrypt from my cPanel and magic! My site is HTTPS now. Three cheers for Open Source and it’s millions of programmers. I also contribute as a grain of sand to the Open Source beach from time to time. Now… if only I can do it for my Raspberry Pi mosquito broker to satisfy Amazon and let Alexa at my home smarts! I knocked up this quick & dirty solution just before leaving my cat for a weekend away. Ashly (cat) is quite happy with us going away for a few days AFAIK but is now geriatric and on thyroid medication so I decided to address this. I needed a wooden box with a lid I could hinge so I used an old drawer I was throwing out. I sawed a couple of cuts in the back, drilled holes and used cut-off nails for hinge pins. I pulled out a 12V solenoid from my parts box and bent up a bracket to mount this on. I just used my bench power supply for a 12V supply. The flap is vertical so needed a spring to ensure it opened. Only trampoline springs in my spring box!! Ball point pen spring considered, finally remembered a couple of neodymium magnets I have so I mounted these with cable straps so they repelled each other and this works a treat! Finally, the brains; a Sonoff S20 WiFi wall socket with a timer setting on E-Welink on my phone to turn on the power supply at feed time and another a minute later to turn it off. Tested it through a cycle then loaded it with food and medication and shot off for a weekend family reunion. It was weighed down with a pot plant (anti-cat tamper) on an outside table in a covered veranda along side his bed and water. Ashly would be very aware of it because it had no baseboard and the wet food smell would be emanating. I can actually control those wall switches from my mobile phone but had not previously tried that before so did it the timer way. Got home Sunday, bingo! Evidence of cat pig-out and most food gone. 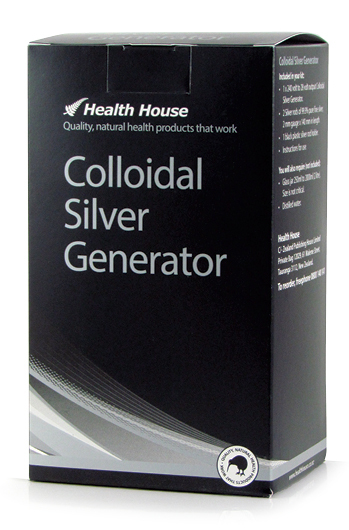 My wife recently bought a Colloidal Silver Generator from Health House here in NZ. It is simple to use but requires some attention. We make 1 litre a time in a “quart” preserving jar. Basically our brew needs a get-going period followed by several electrode reversals. The electrodes are wiped clean with a paper towel between cycles. What a great opportunity for me to semi-automate this process! I chose an ESP8266 product and used a Wemos D1 Mini 4MB from Banggood. It grabs its power from the generator supply using a buck converter to give 5V supply. A dual relay board to switch the polarity of the electrodes. There is also a Buzzer Module an LED indicator and a push button. During operation status information is given. Please note: These are affiliate links. I may make a commission if you buy the components through these links. There is no extra cost to you. I would appreciate your support in this way!